The original character of Romanadvoratrelundar was very interesting, simply because she was the first companion to join the Doctor who was not of his choice. She was allocated to him as assistant by the White Guardian to aid in the search for the elusive six segments of the Key to Time. Romana was immediately seen in her first appearance, Robert Holmes' The Ribos Operation, as a highly intelligent but somewhat superior Time Lady, Academically superior to the Doctor and not above reminding him of it. 'I believe you achieved a Double Gamma... on your third attempt,' Romanadvoratrelundar retorted. Romana even considered using the Doctor as a case study in her thesis! Although useful in helping the Doctor in the quest for the Key to Time, and although a relationship of mutual trust did develop between them, their relationship was still rocky in places, the glamorously efficient Romana was frustrated on occasions with what she saw as the Doctor's inherent disorganisation which led him into his 'escapades'. 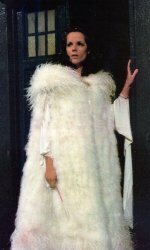 Romana was conceived and portrayed as a very glamorous companion, and this was reflected in the dazzling June Hudson dress she wore in her first meeting with the Doctor. The hem of a long white robe made of a silken material floated into the Doctor's field of vision. He looked up sharply and found himself face to face with a tall, aristocratic woman dressed entirely in white. Her dark hair was parted in the centre and swept back, falling in long curls on each side of her finely chiselled, almost Grecian face. Her eyebrows arched as she fixed the Doctor with pale, unblinking eyes fringed with delicately curved lashes. Romana's great intellectual abilities, and some of her glamour, faltered somewhat when confronted with the harsh realities of life outside Gallifrey. She did display theoretical knowledge but this usually failed to translate into practical action. Romana was visibly shaken by her encounter with the Shrievenzale on Ribos, coming from the academic cloisters of the Bureau of Ancient Records on Gallifrey; her almost ludicrous high heeled shoes were totally inadequate for the terrain around the stone circles in England and highlighted her basic impracticality. This lack of practicality meant an otherwise innovative character was relegated to general companion status. Although the role of companions in Doctor Who is subsidiary to the Doctor, Romana had even less development than most. Her role could equally have been filled by any other companion from Barbara to Peri. She had comparatively little during her season bar to trail the Doctor and occasionally contribute some small solution to a problem. In her final story The Armageddon Factor she can chiefly be remembered only for recognising Princess Astra of Atrios (somewhat ironically played by her successor Lalla Ward) as the sixth and final segment of the Key to Time. In other stories such as The Stones of Blood and The Androids of Tara, she fulfils the general requirements of a companion, twice being kidnapped and manipulated by Count Grendel of Gracht to take the place of Princess Strella on Tara. Possibly her worst story was The Power of Kroll, where she seemed to do little but scream, be captured, and follow the Doctor around. Romana screamed and twisted in her chains, but it was no use. It was almost as if her screams guided the tentacle towards her. It came closer, closer ... then swooped forward. The claw clamped round her neck, choking her. Romana had a good relationship with K9, firmly established in stories such as The Pirate Planet and The Stones of Blood. Sadly this has not been reflected in the mediocre novelisations of her stories, which showed little of this relationship. In her relations with the people she met, Romana seemed slightly distant, perhaps only achieving closeness with the eccentric Amelia Rumford. Certainly there was little opportunity for this when confronted by associates such as Garron or Vivien Fay. There were rare moments of warmth and emotion bordering on compassion in her stories however. Possibly this was most pronounced in The Armageddon Factor, with her genuine anguish over the fate of Astra, transmuted into the sixth segment, in apparent contradiction to her previous single-mindedness with regard to completing the quest for the segments. Romana also had some humorous sequences. Her attempts to ride Vivian Fay's bicycle were indicative of her alien-ness, and while on Earth her lack of knowledge as to human behaviour provided some entertainment. 'Oh, really,' said Romana wondering if the people of this peculiar planet had the power to change into birds. Romana's academic prowess tended to make her rather superior. She was a proselytiser, and once she had decided on something it was difficult to make her change her mind. A prime illustration of this is her immediate assumption as to the identity of the first segment on Ribos. Simply because of its importance she presumed the Great Crown of Ribos to be the First Segment, but the Doctor realises it is Garron's lump of Jethryk. Mary Tamm herself was in Britain a very well known television and stage actress during the 1970s. She was well aware of both the potential limitations and opportunities in the role, but "Apparently, as the sixteenth season developed, Mary was concerned that her character didn't progress. In some ways she felt it regressed." [Doctor Who - The Companions by John Nathan-Turner]. Although a common complaint from companions from Carole Ann Ford in 1964 onwards, the character of Romana and especially her on/off relationship with the Doctor opened up many opportunities which were sadly neglected. "Both Tom and I would have liked to have developed the love/hate relationship between the Doctor and Romana, but I think everyone else was a bit frightened of that because it would have been such a radical departure from the established formula of the series," said Mary Tamm in Doctor Who - 25 Glorious Years by Peter Haining. In her season as Romana, Mary Tamm brought interest and popularity to the role but even more could have been achieved had this fascinating character been developed further. This item appeared in TSV 23 (June 1991).